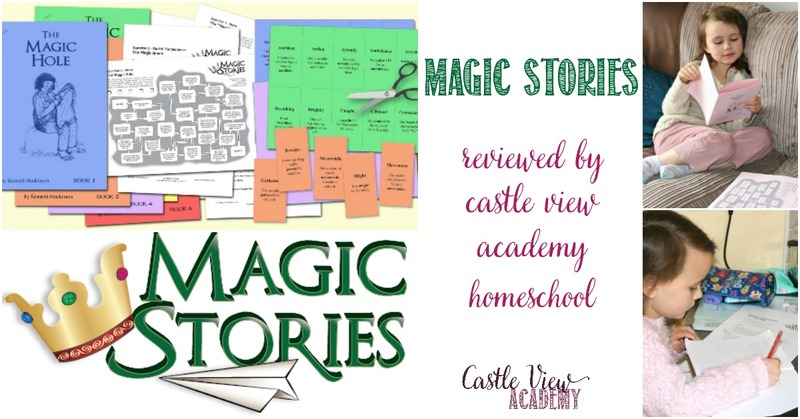 From Allsaid & Dunn, LLC, publishers of The Reading Game and authors of the Wordly Wise series, comes The Magic Stories, which is what we’re reviewing today. 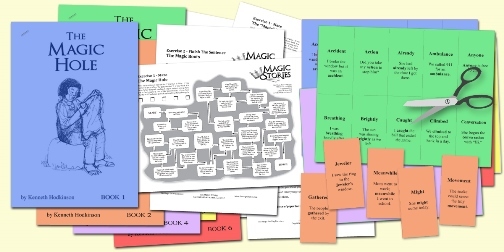 This product comes as a PDF zip down load of the 6 Magic stories, the Naughty 40 flashcards, and the exercise books. You can purchase the whole 6 stories as a set, or individually. This is a supplemental curriculum and I would suggest perhaps one story a week, depending on the student. 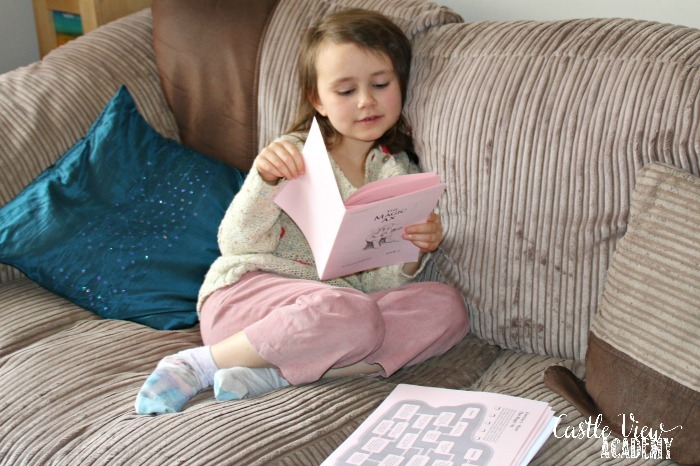 You could even do one worksheet a week and read the story weekly if your child needs more help. Because it’s a download and self-paced, you’re free to work it into you schedule in a way that best suits you. The stories are optimised for an iPad or PC, but I printed them off so that Kallista didn’t have to sit in front of the screen to do her work, and with 4 of us sharing a desk, this worked better for us. I printed the stories in booklet form and each set in a different colour to make things more interesting for her. First, I gave Kallista the pre-test to see how well she knew the ‘Naughty 40’ vocabulary, which are mostly sight words that are a little tricky, such as though, thought, through, etc. It would be brilliant if there were ways included to practice the vocabulary flashcard other than just the standard drills. 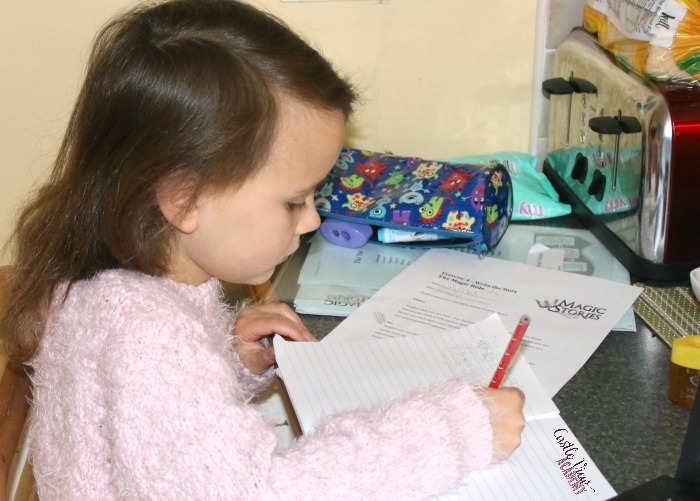 If you are new to home education or not so creative, you may not have ideas on how to improve learning the words needed. Kallista read the story aloud and Tristan and I listened in if we weren’t working on other projects. Then it was time for some comprehension work. With each story is a maze where you get from one side to the other by answering yes/no questions. Should you answer something wrong along the way, you will be sent back again to the last correct answer. You track the number of times you move back, and if you reach 5, then you must read the story again. Next there are some comprehension questions about the story to be answered. Then there are some more imaginative questions to be answered, imagine if you were the boy in the story and this happened to you. What would you do? This helps children think about things in a different light and answer according to their own personalities. The next part gives you two opening paragraphs to choose from (or create your own) and continue writing a story of your own based on one of those paragraphs for a little creative writing work. Finally, there is a post-test for the vocabulary to see if the words have been learned by sight. This is good for those who have a good imagination and enjoy creative writing. It’s something a little different from the usual curriculum, which makes a nice diversion. Because it’s small, it is also easy to take with you on the go. It’s optimised for reading on an iPad so you can read it from there and then just print the question sheets, thus also saving on printing costs. I was a bit frustrated with this as a busy working parent because I don’t always have time to thoroughly read each story, and I thought an answer key would be useful. I am happy to say that our suggestion was heard and there is now an answer key available to download from their website. Thank you! I know some of the questions are self-correcting and creative writing, but for the other questions this will be very helpful. 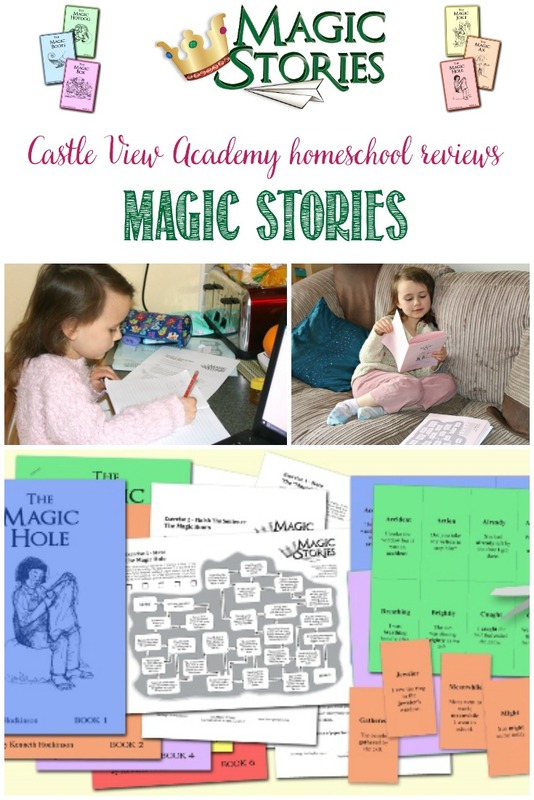 Kallista enjoys The Magic Stories and looks forward to the stories and because she’s always liked doing worksheets, this works pretty well for her. In fact, she is the one who often asks to work on this, which is why we’ll continue to work on them. To read more reviews about Allsaid & Dunn, LLC, by the Homeschool Review Crew, click on the graphic below and follow the instructions. You will find 55 honest reviews by the Crew. If you’d like to know more or would like to follow Allsaid & Dunn, LLC,, you can connect with them through their website, Facebook, Twitter, Pinterest, and YouTube. Thank you for considering our suggestion.